Northlands has been my Midwestern home away from home ever since I first visited the conference in 2008. Now, after 9 years and 5 more conferences, I was painfully aware that 2017 was going to be my last visit for a while. I could not have wished for a better goodbye. The conference, thanks to the New Voices scholarship, turned into a mini-reunion: I got to meet up with three amazing friends and former classmates from the ETSU Storytelling program - Danielle Bellone, Joshua Sellers, and Ingrid Nixon. The conference had a schedule packed with all kinds of events and happenings, but we still found plenty of time to hang out and talk. This year's workshops were fascinating, and heavy on the cultural possibilities and responsibilities of storytelling. Jasmin Cardenas' workshop on Theater of the Oppressed was an intense and immersive experience where we got to play a lot of games, and participate in various activities that brought the techniques to life. Robert and Nancy from Eth-Noh-Tec presented a wonderful, discussion-filled workshop on cultural appropriation in storytelling, which is a vital topic for our art form, and very important to keep talking about (even though there are no blanket permissions or decisive conclusions). I did not take part in them, but there was also a panel on Truth and Story (led by Laura Packer, Jeff Doyle, and Loren Niemi), and a workshop on the culturally relevant classroom by Susan O'Halloran. Northlands really made an effort this year to highlight cultural diversity and artistic integrity. On a lighter note, Ingrid Nixon's Story evolution workshop applied the theory of evolution to oral storytelling, and we had great fun re-telling Little Red Riding Hood in various shapes and forms. 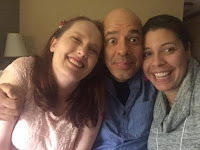 I also got a lot out of Bob Kann's three-hour intensive course on the business of storytelling, where he shared minute details about his thirty-three year career as a full-time professional storyteller. We talked honestly about pricing and income (a topic artists tend to be allergic to), as well as promotion and marketing. Bob is a lovely, friendly person, and he offered up a wealth of useful tips. This year's keynote speaker for the conference was Antonio Rocha. It was lovely to meet him again in person, and spend time talking about various things. As usual, Sunday morning offered a workshop slot for friendly conversation with the keynote, so that we could ask all our questions and talk about whatever we wanted to talk about with Antonio. It was great fun. Of course workshops are not the only thing offered at Northlands. There are also showcases on each day of the conference, featuring a variety of stories and storytellers. Especially memorable this year (to me) were Barbara Schutzgruber (who sang her own version of an awesome ballad about a woman tricking her lover), Jean Bolley (who told a chilling and captivating historical story about a family stuck in a lighthouse all winter), Sue Searing (who combined the Boyhood of Fionn Mac Cool with a story from her own life), Jeff Doyle (who told a hilarious personal story about coming to terms with his mother's dating life), Yvonne Healy (who turned a personal story into a horror tale before we notice she was not telling the truth), Pete Griffin (who told about a wild wolf in Alaska, and how people thought they could make friends with it), and, of course, Eth-Noh-Tec, whose hilarious and very timely telling of Kingdom of Fools was followed up by the gorgeous and lyrical tale of the Bird of Happiness, the closing performance of the conference on Sunday. Next to the official showcases, we also had other performance events. Friday evening featured a one-hour Fairy Tale Swap, where anyone could tell a tale if their name was drawn from the basket. We were so good at keeping with our time limits that every single name got drawn, and more than ten people got to take the stage. I told The Cheerful Prince, a Hungarian version of Rumpelstiltskin from my upcoming book, and people seemed to really enjoy it, mostly for the figure of a kind and clever mother-in-law. Following the swap, we were treated to a late night Fairy Tales for Adults room concert (a performance that took place in someone's hotel room, with more than thirty people crammed inside and sitting cheerfully on every possible surface, nursing glasses of wine) by Danielle Bellone, Laura Packer, and Loren Niemi. Danielle and Laura are this year's recipients of the J. J. Reneaux Mentorship Grant, and they are a match made in heaven. The concert featured gorgeous re-tellings of classic fairy tales; Laura's version of Jack and the Beanstalk with a female Jack and her connection with the giantess, as well as Danielle's lyrical rendition of the Norwegian folktale of the Lindworm, left me completely breathless. 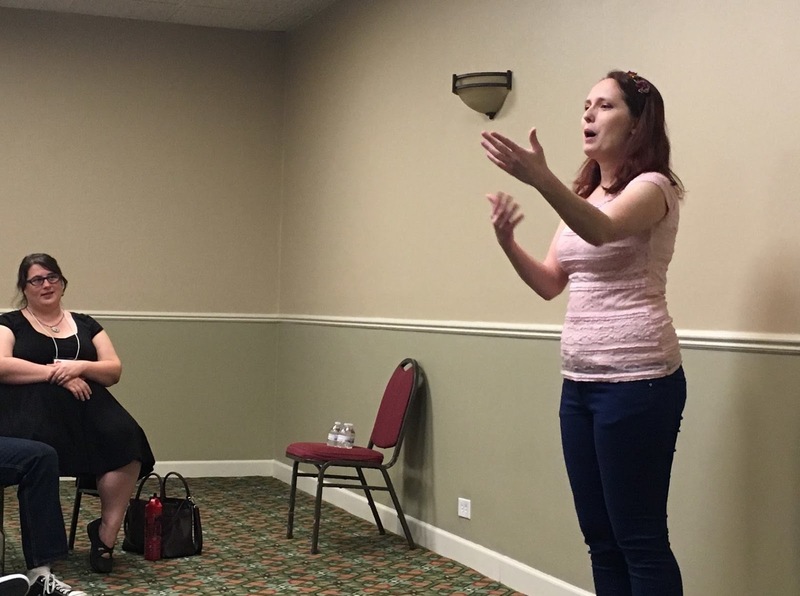 I also had a chance to present a fringe performance Saturday evening. 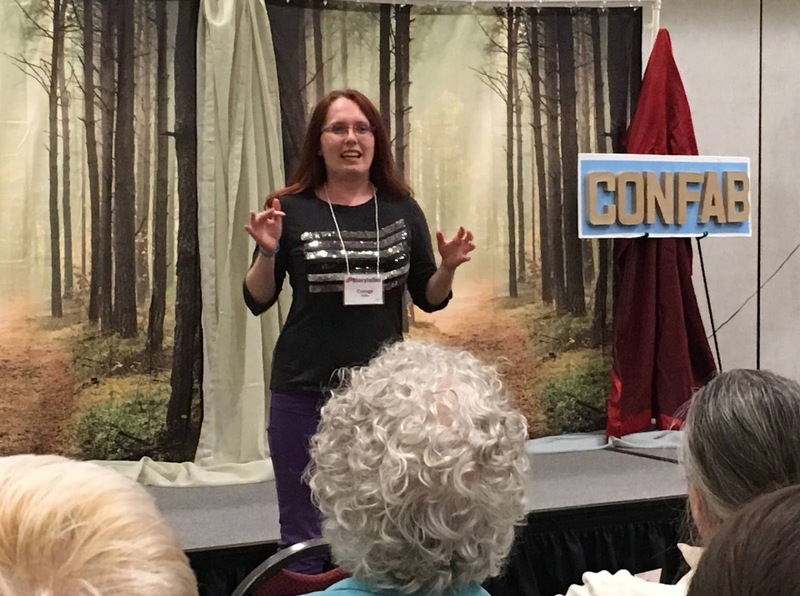 I brought Roses in the Mountains, my show of medieval German legends of Dwarves and Men, to the conference, and I had the privilege to perform it for an enthusiastic audience of storytellers. This was my second time doing the whole show, and I enjoyed every minute of it. Definitely a keeper. Since the theme of this year's conference was Storytelling: The other superpower, I got to throw a Superhero Social on Saturday afternoon, for people to play and relax a little before the evening events (I got tagged as the resident expert on the topic, due to my book). People got capes and masks, and I played snippets of superhero-related music they had to guess for prizes. I also brought some Story Cubes, and brave volunteers could roll some dice and invent new superpowers they could pitch to the audience. I love playing improv games with storytellers - they throw themselves into play with full commitment, and come up with the best ideas. The superhero social ended up being a blast, and people were telling me how much fun they had even the day after. I said a lot of goodbyes at Northlands this year - but even though it was my last visit for a while, I am sure it was not my last one ever. And I know that whenever I return, people will still be just as friendly, and open, and fun, as they have been all these years. Sounds like an incredibly fun time. Glad your last visit (for a while, anyway) went so well. You've been a fixture at Northlands as long as I've been going. I'll miss you! What a fabulous sounding conference! I'm glad you had a wonderful time and hope it won't be long before you can attend again.